The headlines continue to highlight positive developments by operators in the SCOOP/STACK plays in Oklahoma. But who is participating in the production streams BESIDES the operator? What non-operated interests or overriding royalty interests are participating right alongside the operator? Or who was the initial grantee actually leasing for? We’re lifting the curtain with the release of assignments in the SCOOP/STACK—in a big way! Find out what’s been assigned—and what’s not been assigned…yet. Create AOIs around the areas that you want to watch for future opportunities, and do it with this level of detail. Not only can our customers view assignments online within Drillinginfo, they can also create a leasing report in Drillinginfo for areas that they’re interested in. An example is this report on Kingfisher County, OK (STACK play) which shows 1 of 11 new leases taken as recently as 3/15/2017. Use this tab in Drillinginfo to start creating custom reports. Combining customized leasing reports with the power of our DI SCOOP/STACK play assessments is a powerful enhancement to operators who want to unlock current opportunities in these plays. On November 16, 1907, Oklahoma became the 46th state to enter the Union. About a decade before that, in the then Indian Territory, Miss Jenni Cass dropped a “go devil” detonating device downhole and The Nellie Johnson no. 1 well became the first commercially viable oil well in the Territory. Fast forward to July of 2015 and we find the State of Oklahoma contributing the 6th most crude oil and 3rd most natural gas in the country. Not only is Oklahoma therefore in a combined 5th place in terms of energy resource production, it is also the home to the Cushing hub, where orders for West Texas Intermediate (WTI) oil futures are settled for the New York Mercantile Exchange. Much of the news that comes out of Oklahoma lately centers around the disposal water quake controversy, and relative financial health of a few of the very large operators who are headquartered there. The recent selection of Paul Ryan as Speaker of the House has an interesting Oklahoma angle given that his wife Janna Little Ryan’s family has a rich Oklahoma political history. (Their family dogs are Boomer and Sooner). Of particular interest to me is that when we look at a current heat map of permitting activity for the past 30 days, coupled with current active rigs, we clearly see that Oklahoma, particularly the Woodford Shale play in the Anadarko basin, is one of the nation’s bright spots. We’ve written about the South Central Oklahoma Oil Province, or SCOOP, before and how it’s exciting because it tends to be a little more liquids-rich. Operators, such as Magnolia, continue to expand their drilling plan for the play. The competitive (because of geography and branding more so than geology) Sooner Trend Anadarko Basin Canadian and Kingfisher Counties, or STACK play has started to get a lot of interest lately, also due to its potential for liquids. STACK operator Newfield Exploration is one of the best-performing stocks in the S&P 500 this year. The Woodford Shale and Hunton Group and the more recently targeted Springer Shale span from the late Ordovician into the Mississippian in geologic age. If we look at the last 90 days of rig counts by county in the Woodford Shale, we see a slight pullback in the clear leader Grady from 16 to 12 rigs, a slight contraction from 8 to 7 in Canadian County, and a nice rally in Blaine County from 3 to 8. The Other STACK County, Kingfisher, is riding in fourth place, having gained a rig over that time period. Looking at that same time period in just SCOOP and STACK counties, and cross referencing the targeted formations, we see a clear preference for the deeper Woodford and Hunton formations. On November 12, Drillinginfo will release its latest DI Index of New Production Capacity (NPC), which couples rig activity with active permits, compares the new wells’ performance with comparable wells, and creates an estimate for the capacity that will be brought online from that well in the next few months. This next image compares the NPC for Woodford Shale counties from October’s activity. The amount of natural gas capacity coming online from the more easterly Hughes and Pittsburgh Counties is certainly striking, all the more so given that there are only 8 rigs generally running around the two. Just more evidence about how much more efficient the gas producers are getting at their game. Next, Two of the top Five counties on the chart are Canadian and Kingfisher (and the final top fiver is neighbor Blaine), further reinforcing the current investment (and potential results) of the STACK play. And then, also with respectable numbers, Stephens, Grady, Garvin, and Carter show how the heart of the SCOOP is performing. BP Just posted their 2nd Quarter results for 2016, their first report since having “drawn a line under the material liabilities for Deepwater Horizon” spill in the Gulf of Mexico in 2010. Although they missed their target and profits are down for the quarter (due to the low price of oil and weak margins on their refining operations), their strong cash flow and plans for growth should keep them afloat for many years to come. BP is a bona fide supermajor (in fact one of the original “Seven Sisters” that dominated up to 85% of global supply until 1973), with upstream and downstream operations in over 70 countries, around 80,000 employees, and a daily production output of around 3.3 million BOE. Since they have taken quite a beating in public opinion, but are newly optimistic that they can turn the corner now that the disaster liabilities are somewhat quantified, and they are planning to add another 800,000 BOE/day of production by the end of 2020 I thought it would be interesting to look at the impact and breadth of their current US Onshore operations. First let’s look at their current US active production (having removed Alaska and Gulf of Mexico wells). The Wyoming production out of the Green River Basin appears to be fairly evenly matched. Further south in the San Juan Basin there appears to be a slight preference for gas output, particularly on the Colorado side of the state line. Kansas and the Western Oklahoma/Texas Panhandle portion of the Anadarko and Granite Wash seem fairly similar. The Eastern Oklahoma and Texas operations are clearly showing lots of gas. What’s perhaps most striking about this map is not where BP has onshore US operations, but where it doesn’t. The modern unconventional basins – the Bakken, the Eagle Ford, the Marcellus – and even the mighty Permian Basin are not in their named operator portfolio. This is not to say that BP is a stranger to unconventionals – they have extensive non-ops, minority stakes and partnerships, like their partnership with Lewis Energy for 1400 wells in the gas window of the Eagle Ford. Their absence as a player of record in the unconventional basins does make sense when you take into account the PR nightmare they were dealing with during the bulk of the uncon build-up between 2010 and 2014 – they sold 400,000 Permian Basin acres to Apache as one of their first emergency efforts in 2010. BP’s new Lower 48 chief David Lawler, calling upon his previous unconventionals experience at Sandridge, has already started putting plans into action to update BPs approach to E&P and harness the full stacked potential of the basins that they are established in with low-cost, high-frequency wells and are experimenting with multi-lateral wells. They are also taking a more forward view of the production life cycle with plans for refracturing and infill wells prepared alongside original plans. Let’s take a quick spin through some of their activity. First, we see that, although occasionally spiky month to month, their past five years of permit activity has stayed within a fairly shallow range. Also, it is clear they are not very involved in the drilled and uncompleted wells game. Next, we see, in terms of first six-month production Archuleta County in Colorado is nudging just ahead of proven performer Coal County in Oklahoma, which goes to illustrate why Lawler is so bullish on the company position in the San Juan Basin. Finally, a quick snapshot of Cumulative Production over the past 5 years clearly exhibits the dominance of the Green River Basin in Wyoming in the company portfolio. Finally, one of my favorite things about BP is the annual Statistical Review of World Energy, a report they have been preparing for the past 65 years that is just chock full of information about the current state of the industry. Their establishment as both a major upstream and downstream player gives them a very good vantage point. Of course, I recommend you go read the whole thing for yourself, but here are a few of the interesting tidbits I pulled out of this year’s Review. BP is keen to put some distance between themselves and the Deepwater Horizon incident. In terms of US Onshore operations they have good acreage that they are excited to more fully explore with modern tech. Previously we have discussed the Permian Basin in quite a lot of detail, historic and current context, geological framework, and a number of operator analyses. In terms of current news, much attention is given to the new horizontal E&P going on in the Delaware Basin. But of course the Midland Basin is maintaining a respectable clip in terms of activity and innovation, so let’s take a look! First for context here are all the wells that have come online in the past 5 years in the Permian Basin, with bubbles colored by production type and sized by first 6 month BOE (6:1), and the currently active rigs throughout the area. Clearly we see the twin lobes of the Delaware Basin to the west and the Midland Basin to the East. The blue horizontal wells dominate in the Delaware lobe and in distinctive portions of the Midland. Many operators in the Midland are combining vertical wells with hydraulic fracturing across the stacked pay potential, so don’t look at those Vs as if they’re straight up conventional . On the right I have superimposed the paleomap of the Early Permian which helps highlight the Central Basin Platform that divides the two lobes. Speaking of rigs, lets take a look at the last 6 months of rig activity in the basin, compared with the same period last year. Clearly there is a lot less activity, and a strong consolidation into the core 6 Counties of Martin, Howard, Midland, Glasscock, Upton and Reagan. Yoakum County is showing a new flurry of activity. What’s going on in Yoakum? Let’s start with permits. Here we see a breakdown and placement of the 443 active permits in the county. Oxy obviously has bigger plans in the county, but it takes a while for permits to turn into production, so let’s take a different look at Oxy across the Permian. These wells have all started production in the last two years. There is a fair amount of New Mexico and Texas Delaware Basin activity, a nice concentration of new wells around Big Spring, and a cluster of wells down to the west of Crane, TX. Also, it’s interesting that Yoakum is in 14th place of new producing wells, so today’s permits will probably shift that ranking in the future. Let’s look at current information flowing out of the core sixpack of counties in the Midland basin. This next image shows currently active wells that were brought online in the past 5 years, colored by current operator, and sized by cumulative oil. I have also overlaid the contours of the Wolfcamp Formation. The area of Glasscock County south of Garden City catches my eye, because there seem to be a variety of operators and a variety of well sizes, and a lot of concentrated activity. In this next map of that region the bubbles are currently active wells, brought online in the past 5 years, colored in orange, and sized by cumulative oil. The block outlines are our LandTrac Units, which have been cleaned up, compiled, and matched to (and colored by) the permitted operator. The lines are the directional surveys of the actual horizontal wells. I have selected a lease on the left and pulled up the information on that lease to the right, where we see it’s been active for a little over 5 years with 17 wells and very respectable production numbers. Let’s take a quick look at the subsurface from that same area. And they say that West Texas is empty! Here you can see all of the wellbores looking off in one direction, the red and the blue verticals have well log information, the wispy perpendiculars are the actual stimulations and we see that, yes indeed, many vertical wells have indeed been hydraulically fractured. This 3d subsurface view can be hard to understand, so I recommend this 6 minute video by our CEO Allen Gilmer if you want to know more about how it works. In the current oil-price environment we have all seen the tremendous decline in the number of active rigs across the country, in part led by steep attrition in the far-from-market Bakken and the less bountiful non-core acreage in the Eagle Ford. But there have been a few play areas that, though they have certainly suffered from the downturn, have kept activity levels up better than the national norm. Previously we have discussed Oklahoma, led by its STACK and SCOOP; the Permian Basin’s Midland and Delaware basins, and recently the Utica Shale in Ohio. But there is one play that pops up in a lot of operator presentations and analysis and news that we haven’t touched on recently, the mighty Niobrara, and in particular the oil rich donut of acreage in Weld County, CO. The rock is always the most important factor, so let’s start there. I asked one of the geologist’s upstairs (Tiffany Guiltinan) to send me some info on what their team has been working on in Weld County. This first image breaks down the different tops that the team has identified and picked throughout the play area (the Chalks and the Marls, etc. ), and also the resulting zones (Niobrara A, B, C, Fort Hays, etc.). On the right is an example of the impact faulting can have on a section – in this case the Fort Hays limestone has been faulted out in the second log from the right. She wasn’t sure if that was interesting or not, but I thought it was. She also sent me a few charts related to the work the team has been doing with corroborating directional surveys to the different zones. The upper left chart shows that the Niobrara B (with 43%) and C (with 23%) are clearly the most popular landing zones. 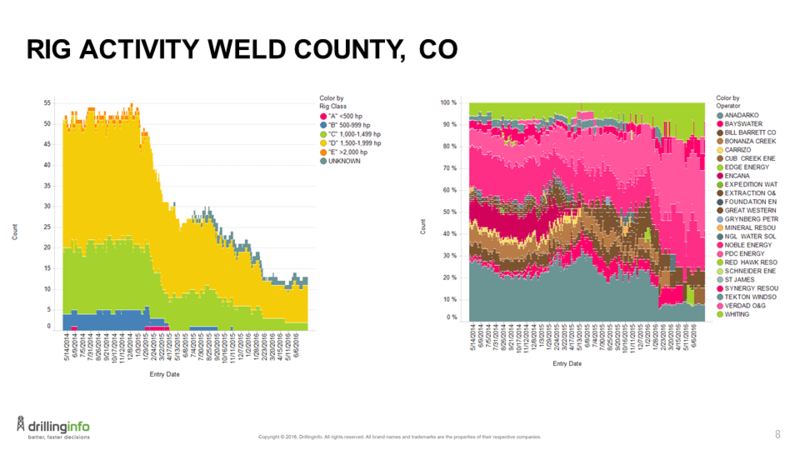 The lower left shows that two thirds of Weld County horizontals are using a toe-down trajectory (more on that later). Upper right shows that most wells have a horizontal length around 4000-4500 ft, and lower right shows that most wells are going north/south or east/west. If you want a little more background on the geology of the Niobrara, you can refer to Tiffany’s excellent post on the Smoky Hill Member, and Clint Barefoot’s The Niobrara Shale Formation – From Idea to Action in 10 Minutes. Before we go too much further, lets add a little geography to mix, so we know where we are. For wells that have been brought on line in the past 5 years in Weld County, we see the donut-ring of oil production surrounding the donut-hole gas production in the southwest part of the county. And looking at the same area, with active permits, we can see where some of the bigger name operators are focusing their activity. One of the most striking parts of the permit image is the lines of permits that line up straight north/south or east/west. Hmmmm. If we zoom into the area near Riverside Reservoir in the middle of the map, on the left we see when the permits go north/south, the wells go east west, and then when we overlay our (new) landtrac lease outlines, everything becomes clear. Since Colorado lines up their mineral rights in a PLSS system, lining up your wells along one edge and drilling to the other edge makes total sense. I said I would get back to toe-up vs. toe-down trajectory. Consider the following well. This is a well from that region near Riverside Reservoir. The red line represents the directional survey of the well as ingested and QCed by our data team. The colored areas represent the limits of the various zones as picked and QCed by our team of geologists. We determined the “heel” by selecting the point at which the well achieves an 80 degree from vertical in the survey (the blue point on the left), and the “toe” is the end of the well (the blue dot on the right). So in this case the toe is lower than the heel, whereas had we used, say, 88 or 89 degrees the toe might actually be higher and therefore “toe-up.” Also of interest is the fact that in this case the geological stack of formations is trending downwards , which means the hydrocarbons from the toe are going to be from the top part of the formation (in this case the Niobrara C), while nearer the heal they will be from the middle of the formation. Oh, also this well is drilled at an average azimuth of 88.94 degrees, meaning it is going from the west to the east. Speaking of toes, perhaps we can see a little bit of an upturn at the toe of this chart of rig activity in Weld County? On the left we see the larger class rigs, capable of making the turns and keeping on schedule, have come to dominate the landscape, and on the right we see that, as expected, PDC, Whiting, Noble and Anadarko have taken over most of the action. The unconventional oil boom and off-the-chart production increases that occurred between 2008 and 2014 in the U.S. were driven mostly by technology, and chief among these technologies were horizontal drilling (which allowed E&P operators to follow the prevailing formations laterally), hydraulic fracturing (which allowed the operators to increase the permeability and porosity of tighter geologic formations), and the use of proppant (sand and fluid designed to keep the fractured pathways to the wellbore open). The high price of oil during that period kept broad experimentation economically feasible, and the nature of the financing game kept most operators focused on the huge gains available in initial production, perhaps even at the expense of steeper decline rates. What a difference 18 months can make. One thing that hasn’t changed is the rock – players that leased positions early enough in strong acreage to get fantastic deals still have a tremendous advantage (unless they miss their held by production quotas). But as the price of oil continues to hover in the $40s, most of the high dollar hedges have been played out, the financial sector is paying a lot closer attention to valuations and expected returns, and we’re again looking to technology to help us win the day. Companies that are focusing on technological progression are going to have a natural advantage in reducing cost and getting to market, so let’s take a look at a few of the technologies that are being leveraged in the oilfield today, and what we might expect in the near future. Previously, we’ve talked a bit about Enhanced Oil Recovery (EOR), and some of the advantages that “flooding” existing wells can have in a down market. Although lately there have been more tests with polymers and surfactants, nitrates, and even microbial methods, by and large we’re still seeing standard methods using steam (for heavy oil) and miscible gases (CO2 and HC) for lighter production. Perhaps the strongest banner carrier for EOR right now is EOG, who are widely regarded as way ahead of their peers in terms of high-return unconventional E&P. The way they have it figured, they have a $15-$20/barrel cost advantage over the rest of the industry, derived from some of the very best acreage, the fiscal patience to wait out wells until they can deliver a 30% return, and a very promising EOR pilot program in the Eagle Ford using natural gas as the flood. Modern power sources like the FlexGen Generator that can provide a more economical and secure power source to the pump stations. Additionally, we will see many operators describe “overpressured” situations that imply that we have to spend even less energy in getting those hydrocarbons to the surface. We have discussed the stages of well completions in some detail. Here are a few techniques that are getting some attention. To address those issues, newer PNP systems have a few new tricks. For example, the new Gator Perforating System doesn’t use explosives, and Schlumberger has a new dissolving frack plug system that prevents the operator from having to mill out the perfs. Monobore, or single-string completions, have come into usage in some of the North American unconventional plays. Since you don’t have to transition the casing sizes, there is less down time in the drilling operation, and if you’re using larger casings, your flow rates will be increased. New subsurface imaging techniques, like eEM from Deep Imaging, allow you to see enhanced visualization of your fracked volume. New proppant additives like CARBO GUARD help preserve equipment life downhole. Probabalistic data analysis deals with information quality issues, data resolution, limitations of data, and helps you get to the best answer, fast. Drillbit technology improvements and quicker geosteering feedback have great potential for reducing NPT. Zipper Fracking – I’ll talk about zipper fracking in a future article. Technology improvements continue to be a major driver in the oil and gas industry, with the current downturn providing the opportunity to build those improvements around efficiency. Less waste is good for the operators, for the financial backers, and most of all for the long term energy needs of our world.